Director & choreographer Andy Blankenbuehlerr during the final rehearsal of the Broadway Musical “Bandstand” at the Bernard B. Jacobs theater in Manhattan. 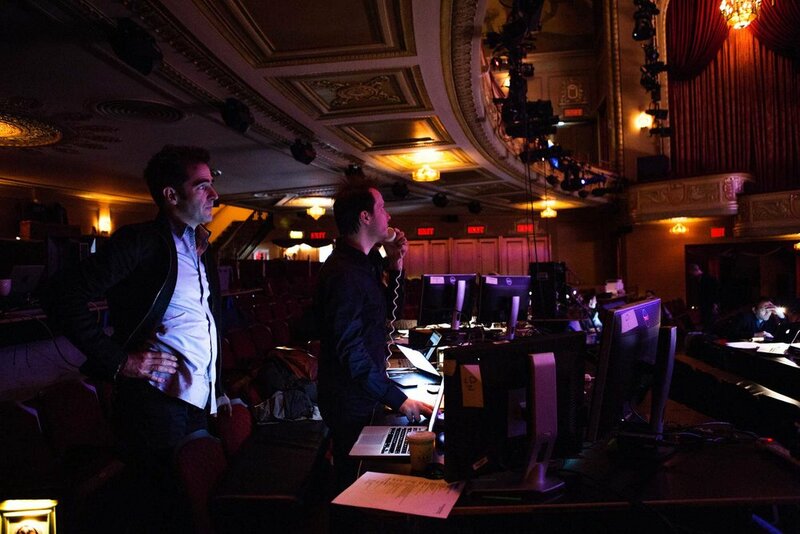 Mr. Blankenbuehler, left, with the lighting designer Jeff Croiter. 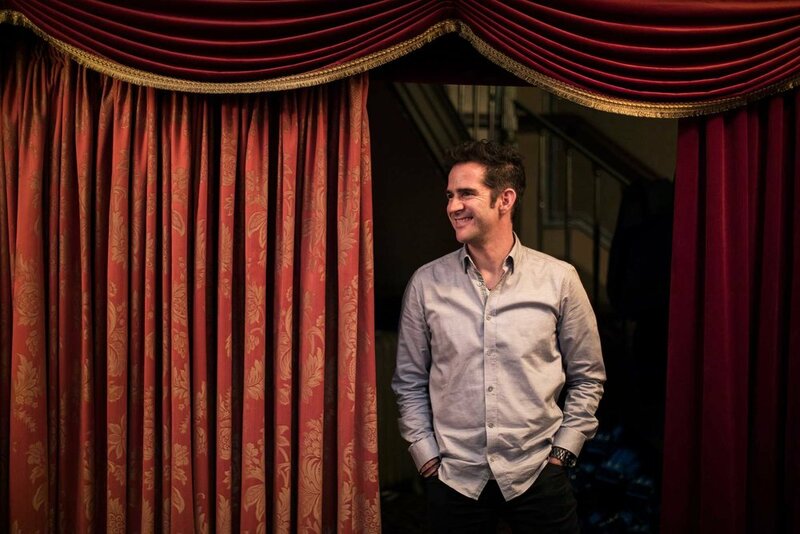 11:48 a.m. For the first fix of the day, Mr. Blankenbuehler had to figure out why light and actor weren’t gelling in a “button,” a tiny moment that signals to the audience that an element in the show is over. He consulted with the lighting designer, Jeff Croiter, on how best to handle a first-act transition in the number “You Deserve It,” set at a bar and involving the actor Drew McVety and the ensemble. Mr. Blankenbuehler gives notes to the actors. 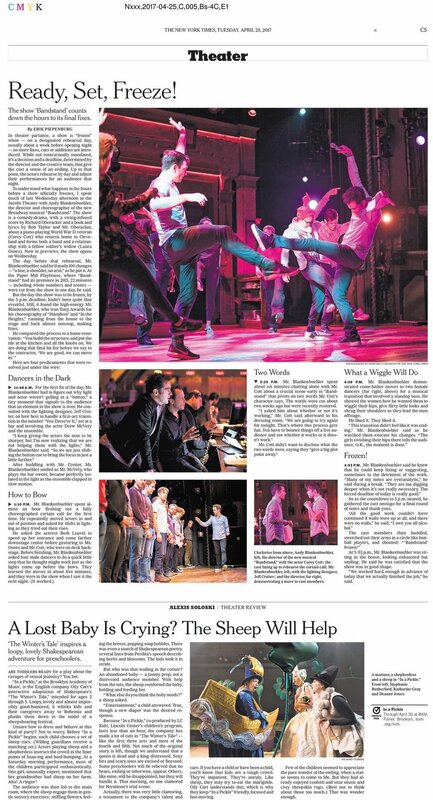 12:08 p.m. With the actors in street clothes — T-shirts, sweatpants and, for some of the women, kerchiefs — Mr. Blankenbuehler spent about 20 minutes going over individual notes. “Hold the glasses like they are real things,” he said to the assembled actors, referring to the props they handle in the show’s many nightclub scenes. 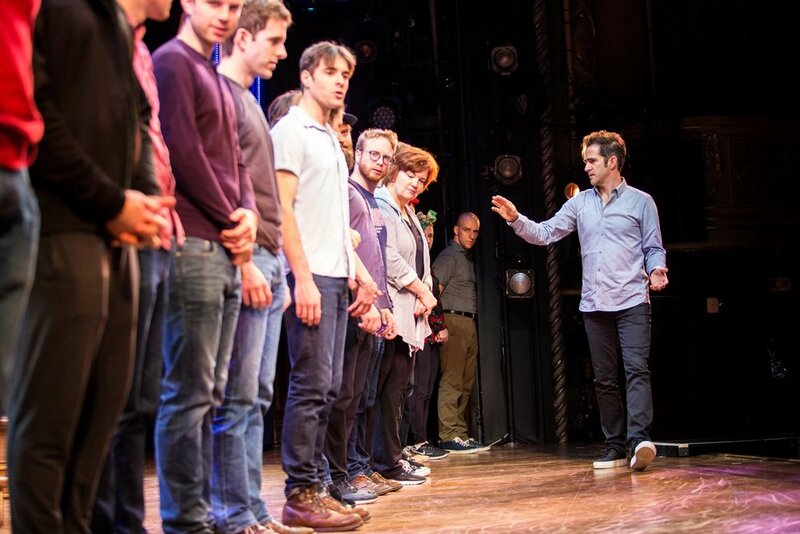 The cast lining up to rehearse the curtain call. 1:10 p.m. Mr. Blankenbuehler spent almost an hour fleshing out a fully choreographed curtain call for the first time. He repeatedly moved actors in and out of position and asked for shifts in lighting as they tried out their cues. Mr. Blankenbuehler, left, with the actors Laura Osnes and Corey Cott. 2:05 p.m. Repeated calls of “Five, six, seven, eight” echoed throughout the theater as Mr. Blankenbuehler figured out the right way to properly light Ms. Osnes and Mr. Cott as they came into position during a number featuring an onstage microphone. He then spent about 10minutes making tiny adjustments to a complicated-looking dance sequence, finessing over and over the dancers’ leg extensions and speed as they sang the lyrics “the boys are back.” In the show the moment lasted all of about three seconds. Mr. Blankenbuehler, left, with the actor Corey Cott. 3:25 p.m. Mr. Blankenbuehler spent about six minutes chatting alone with Mr. Cott about a crucial scene early in “Bandstand” that pivots on two words Mr. Cott’s character says. The words were cut about two weeks ago but were recently restored. Mr. Blankenbuehler, right, with the actor Corey Cott. Actors rehearse a dance number. 4:09 p.m. Mr. Blankenbuehler demonstrated come-hither moves to two female dancers (far right, above) for a musical transition that involved a standup bass. He showed the women how he wanted them to wiggle their hips, give flirty little looks and shrug their shoulders as they lead the men offstage. Mr. Blankenbuehler at the show’s final rehearsal. 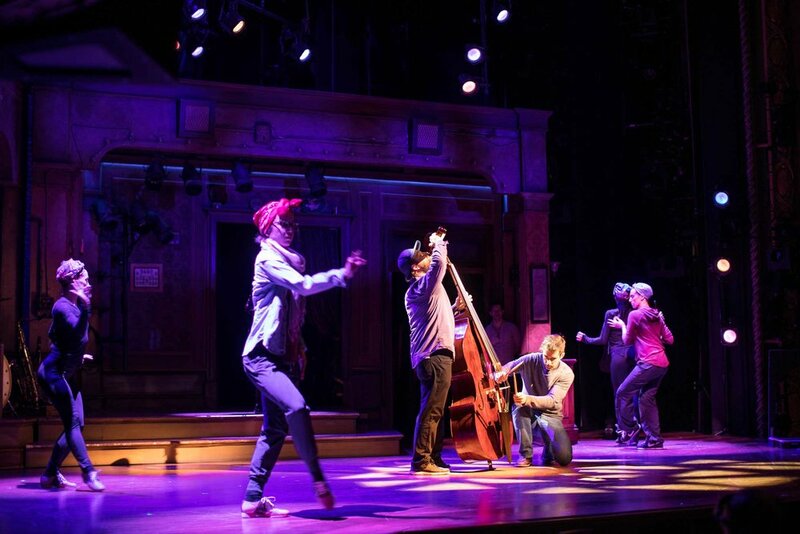 Director Andy Blankenbuehlerr demonstrates a dance move correction for the Broadway Musical “Bandstand” cast during the last rehearsals at the Bernard B. Jacobs theater in Manhattan. Mr. Blankenbuehler at the Jacobs Theater. 5:03 p.m., Mr. Blankenbuehler was sitting in the house, looking exhausted but smiling. He said he was satisfied that the show was in good shape.